We've got another special guest this week. Rachel Edidin has thought more about the internal workings of comics than just about anyone else I know. She's an Associate Editor at Dark Horse Comics, tweets at @RaeBeta, Tumblrs at Postcards from Space, Scrapscallion and Kevin!, led the legendary Idiot Nerd Girl meme-coup, co-edited the Pete & Pete zine Waiting for October, and wrote a story in the issue of Womanthology: Space (#3) that came out this week. I had the pleasure of discussing the collection of "Mandroid" and "Mandroid: Instrument of War" with her. 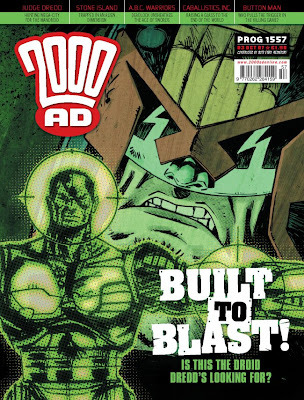 RACHEL: I came into Mandroid completely cold: I'd been wanting to read 2000 AD for a while, but when you asked me to do this, I decided it would be more interesting for both of us if I held off. So, this is my first and only Judge Dredd: No comics, no movie, not even Wikipedia. Given my Dredd virginity, the intimidating volume of material that technically precedes Mandroid, and the notoriously intricate chaos of the world (worlds?) 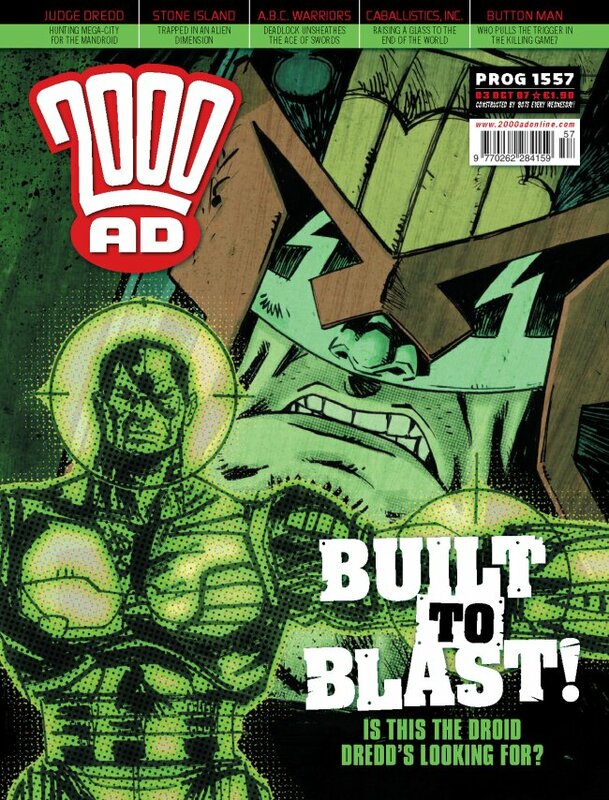 of 2000 AD, I went into this expecting to be confused, and I was pleasantly surprised at how accessible it proved. John Wagner's very good at integrating information into dialogue that's not otherwise expository, and he's written himself a premise that allows for a lot of Mega-City 101 lessons without the impression of infodumping, as Nate and Kitty struggle to navigate first the city and later the justice system. Plus, it's part police procedural, which is a signed, sealed, and laminated license to exposit. Speaking of the justice system, the one place I found myself consistently confused was with the Judges themselves. They might be designed to represent a faceless, fascist system, and it's done well enough that I have a hell of a time telling them apart, which I'm obviously supposed to be able to do easily. I can't. I had to poke around for clues and re-read sections, and it screwed up the pacing, and I suspect there's a whole lot of ongoing intrajudicial intrigue and drama that sailed straight over my head. 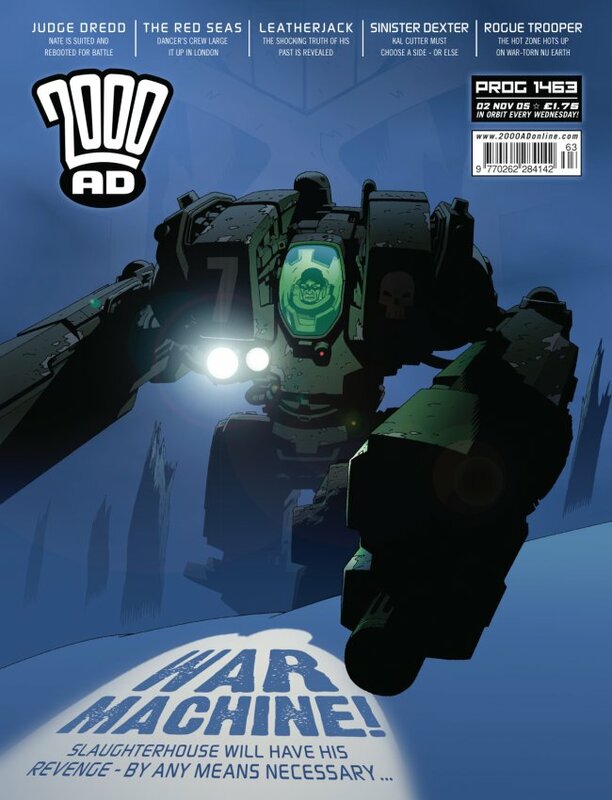 One very odd thing about Kev Walker's artwork on the first "Mandroid" sequence--that's a Walker cover above, by the way--is that he doesn't show anyone's badges, which are usually a useful sign of which Judges we're seeing. (When he shows us one who isn't Dredd, he usually still gives us some visual indication that it's somebody else: Tillson in part 2 is a trainee, which is why he's wearing a white helmet, and the other Judges in part 6 don't have Dredd's jawline.) And while there's a touch of intradepartmental intrigue in Mandroid (the SJS stuff near the end), there's actually not nearly as much as there usually is: Dredd is, unusually, the only recurring character who appears in this sequence. Here's a question for you: as somebody who knows the internal clockwork of American comics very well, what seems formally different to you about this stuff (other than page dimensions and six-page episodes)? RACHEL: Honestly, not much that can't be accounted for by the larger format. If you'd told me this was an American book, I wouldn't have blinked. 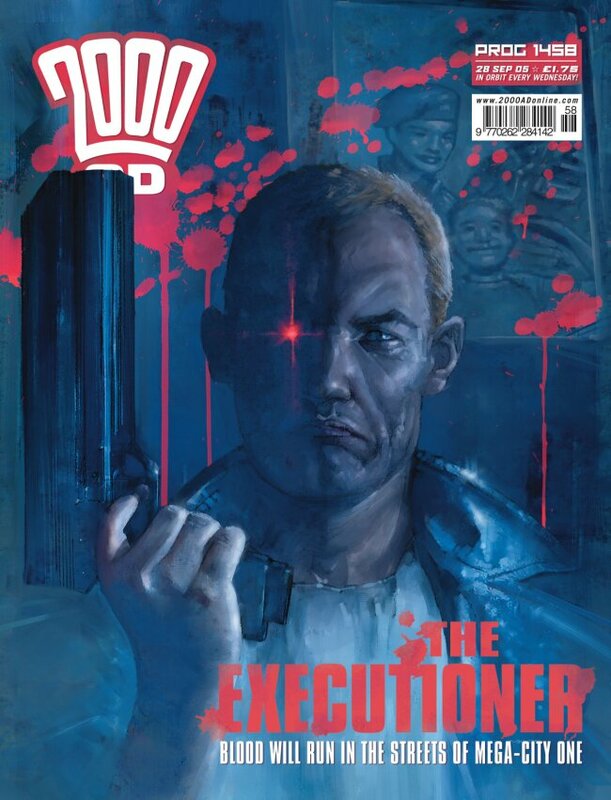 I don't know how much of that is era-specific--I came into comics mid-Vertigo, post-British Invasion, so it could be that what an older reader might see as specifically British comics sensibilities are, to me, what a significant swath of comics have always looked like. That said, the difference in what you can do with pacing and layout in a larger page is really striking. Do you know if Wagner wrote the first Mandroid story with a sequel in mind? It's such a quasi-conclusive ending--Slaughterhouse limbless, in prison; and coming back two years later to start a story with his escape--still limbless, mind you--is both straight-up insane and a little brilliant. DOUGLAS: I have no idea! Wagner doesn't talk much about his long-term plans--he talks about his work, in general, as little as he can get away with--but he does tend to let stuff sit for a long time, and if he hasn't actually killed a character off, that means it's a character we stand some chance of seeing again at some point. 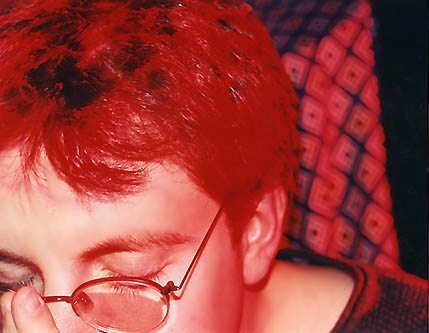 The third "Chief Judge's Man" story, for instance, appeared almost two years after the second, the idea being that Armon Gill has been rotting in jail for a long time, waiting for his contact to come through... and Vienna showed up again close to twenty years after her first appearance. RACHEL: Yeah, but "jail-break after two years of rotting in jail" and "jail-break after two years of rotting in jail while fully dismembered" are two pretty different animals. the former is pretty standard sequel fodder; the latter is such a direct inversion of what's usually a decisive end to a story--Johnny Got His Gun notwithstanding--that it's hard to imagine it wasn't set up as such. DOUGLAS: True enough--except in mainstream comics, where if you see the corpse the character might be dead, and if you don't the character definitely isn't. To be fair, "dead is dead" usually applies in the Dreddverse, with very few exceptions. RACHEL: But, again, usually not dismembered! In some ways, that kind of mutilation is more final than death in comics. As for the exposition I mentioned earlier, I'd love to test it out--tell you how I think the world works based just on the story, and see how close I am to the real deal. RACHEL: Okay, so, the world, based off Mandroid: The U.S. is under totalitarian government--how the judges connect to the military is unclear, but they're obviously not the same body. Whether or to what extent that influence extends to other nations isn't clear; we establish in "Instrument of War" that Canada, at least, is outside of the judges' jurisdiction, so I assume relative sovereignty's roughly the same as what we've got now. Mega-City One, where the story takes place, is a sprawling megalopolis divided into districts or neighborhoods. Here, we see mostly the slums; presumably there are higher-class sections. The Judges seem constrained to some extent by due process--Shultz, for instance, can't be held without charges--but at the same time, they're law enforcement and court rolled into one, and they seem to have little to no external oversight, at least within these couple stories. What they do have is rocky and factionalized internal politics; Dredd himself seems significantly more moderate than most of his compatriots. As with most authoritarian states, there's a pretty wide class divide, and thriving organized crime, which controls--at the least--drugs, human trafficking, and extortion rackets. The judges are aware of this stuff but have limited power to take it down--which, again, speaks to limits on their power to act discretionarily. All we really see of the military in these stories is Space Corps--presumably national, although if they're dealing with extraterrestrial conflicts, they might be a coalition force. Either way, they're at war, or at least engaged in an ongoing conflict of some kind. This is made possible by significantly advanced tech--in Mandroid, we see someone rebuilt from almost nothing, not even a full torso; crazy battle armor; and brainwashing with electronically enabled remote-control. The Judges do have internal regulations, which are subject to change, but they don't have an overseeing body (although they have internal police, the "SJS"--Special Judicial Squad--mentioned near the end). One department doesn't necessarily know what the other is up to, as tends to happen in a bureaucracy. They have a relatively hard time dealing with organized crime because it's, well, organized; the Judge system was formed to combat street crime with "instant justice," but it's less well suited to dealing with systemic problems. Which may be why Mega-City One has wall-to-wall systemic problems. 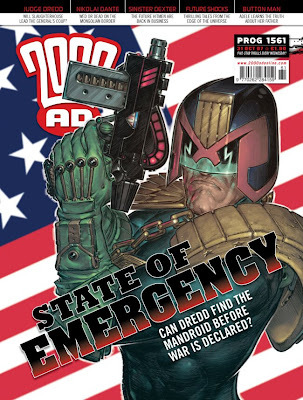 Dredd is not always more moderate than other Judges--in some ways, he's the hard-liner to end all hard-liners--but he does tend to be sympathetic to people who believe they're acting in the public interest, as long as that's compatible with his view of acting in the public interest. The Judges are, in some ways, Plato's philosopher-kings, raised from the age of five to be in the service of the law and nothing else. So are there things that bug you about the two "Mandroid" stories? RACHEL: Nothing overwhelming. Wagner is remarkably unsubtle--especially in the second sequence, I worked out both the twist behind Kitty's remarkable recovery from freezer burn (see what I did there?) and General Vincent's angle almost immediately, and the execution of those wasn't artful or satisfying enough to make up for the transparency. Speaking of Kitty, I was disappointed to see how quickly she was out of the story as a character--between her and Nate, she's the one whose PoV I found way more interesting, and I genuinely thought at first that Wagner was building her up as the main character. That she was instead fridged to inspire Nate's hackneyed vengeance spree was a damn shame; in addition to objecting to how flat-out tired that device is, I think the bulk of the story would've been much stronger for her inclusion. When we see her again in "Instrument of War," we know just about immediately that the real Kitty isn't coming back--but Nate doesn't get that. So what's driving him isn't entirely vengeance, it's also (misguided) hope. Even after we know exactly what's happening, though, it's something of a shock when we see Dredd speaking through her mouth: that's the moment when we know that everything's lost. 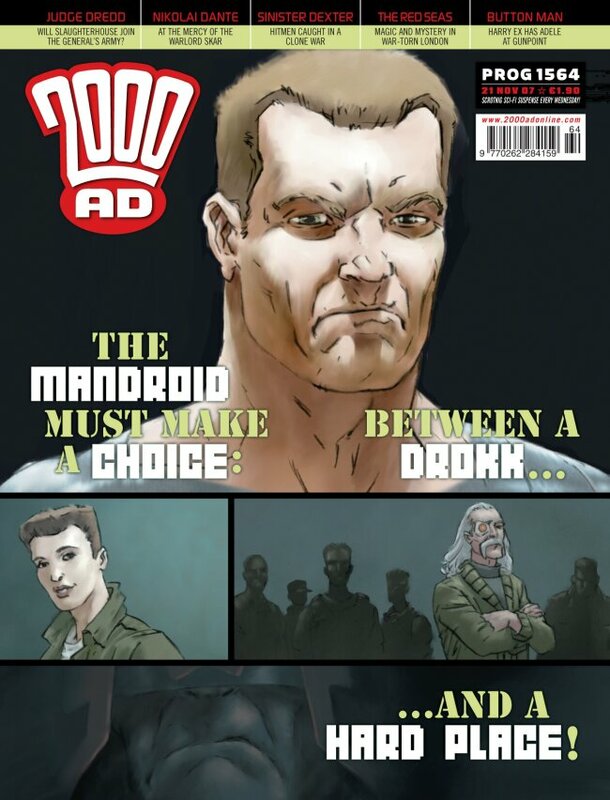 Really, both parts of "Mandroid" are stories in which nobody gets what they want. Everyone, from Nate to Tillson to Melody to Shultz to Lefty, gets hammered for even trying. For the first few chapters, what we want--and what we think we're going to get--is a story about Kitty; we never really get that either. Thanks again to Rachel! Next week: novelists Sara Ryan and Gordon Dahlquist join me to discuss Origins.